A bobcat - a consummate predator and a bold raider - can become a nuisance that has to be controlled. Its screams in the night can frighten youngsters. If rabid, it can pose a serious threat to humans. Deprived of natural prey, it may turn to livestock and pets for food. Attacks by bobcats on humans are rare. Normally if a bobcat approaches a human or seems aggressive towards you it is most likely sick or rabid. If a bobcat tries to attack you do whatever you can to defend yourself. If attacked, seek medical care promptly. If the bobcat is killed during the attack, make sure you have authorities examine the carcass of the bobcat for rabies or other diseases. If you see a bobcat hanging around a populated neighborhood or where people frequently hang out, notify animal control authorities immediately. They can observe the bobcat and remove it from the area if it seems to be a threat. A bobcat that preys persistently on free-ranging livestock may require relocation or extermination, probably by a government agency or a commercial trapper. 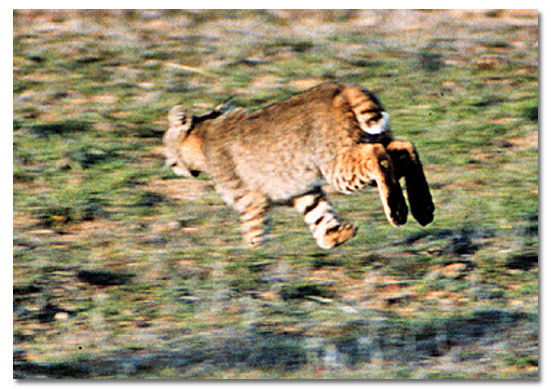 Contact your local Department of Fish and Game for assistance with removing bobcats or other predators from your area. How can I protect my dog or cat from bobcat attacks? What do bobcats look like? If you can discourage bobcat visits and predation, you could not only increase the security for you and your family as well as for livestock pets, you could very well save a bobcat's life. Click here for a Movie of a Bobcat.